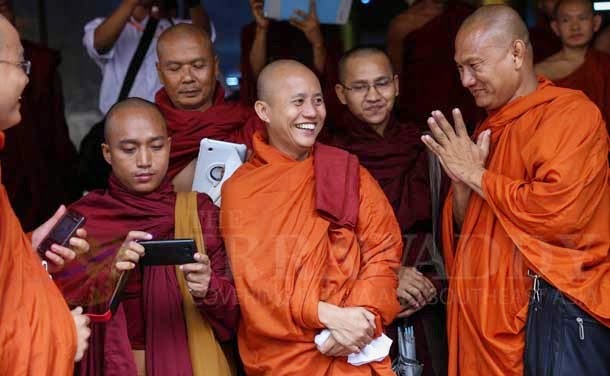 RANGOON — Radical monk Ashin Wirathu, known by many for his incendiary online activity, has been something of a digital hermit in the months following deadly inter-communal violence in Burma’s second largest city, Mandalay. The outspoken Buddhist nationalist and widely revered religious leader claims that his social media accounts are being tampered with; some of his content has disappeared and he has had difficulty accessing his personal accounts. Facebook has yet to respond to questions regarding whether his account has been suspended or terminated for violating their terms of agreement, but the social media network’s terms—which are publicly available—explicitly state that users will be notified via email should their account be terminated. The company has also stated that they do not monitor or censor content, but their policy does allow for review and removal of content when appropriate. Wirathu said that he does not know if Facebook tried to notify him of any changes to his user privileges because he has not checked his email. In late June, Wirathu shared several Facebook posts with his more than 30,000 friends and followers spreading unsubstantiated accusations against two Muslim teashop owners, claiming that they had raped a Buddhist maid. A post created on July 1 stated that he had attempted to contact the two men, who are brothers, and demanded that they be held publicly accountable for their alleged crime. Wirathu then shared another entry containing the names, phone numbers and addresses of the accused, which was widely shared by other users. Several hours later, a quarrel broke out between the two brothers and their Muslim customers when they closed their shop early. Hordes of angry Buddhists joined security forces at the site and violence later ensued between the Buddhist and Muslim residents. Riots continued the following evening, leaving two men dead. A curfew was put in place and access to Facebook was temporarily suspended. Calm and services later returned to the town, but Wirathu claims that he still cannot access all of the content and features that he could in the past. He suspects that his account is being stalked by “flaggers,” who report inappropriate content to be removed by Facebook. He also believes that hackers have tampered with his account. The monk claims that he can sign in to his Facebook account, but that he cannot create posts and he is automatically logged out after a few minutes of use. He also said that every post he has created since October 2013 has been removed from his page. Wirathu said he has created a new Facebook account under the name Wirathu Masoeyein, written in Burmese, and he has been able to post content freely. His blog, also under the title Wirathu Masoeyein, now has more than 100,000 followers, the monk claims. While he and other members of the Buddhist community often use social media to inform their followers of religious ceremonies and news about the monastery, he has also been known to share unverified accusations against Muslims, and has been accused of using “hate speech” that could incite violence. Attempts to contact Facebook to confirm whether Wirathu’s privileges are being stemmed by the company were unsucessful, but individual users told The Irrawaddy that they have flagged some of his content for removal. “Since the riots happened, when I see something brutal or hateful on Facebook, I immediately report it because I don’t want to see any more violence,” said Kyaw Kyaw Maung, a Mandalay resident who lives in the riot-hit Chan Aye Tharzan Township. “I have reported some accounts, including U Wirathu and several other extremists. “I think this is the responsibility of every citizen, to prevent hate speech and promote peaceful living,” he said. Nay Phone Latt, a well-known blogger who heads a campaign for the elimination of hate speech, agreed that reporting inflammatory content is necessary to prevent the spread of hatred, but urged all citizens to be both responsible and discerning while sharing and reading Internet content. “Although reporting someone’s post is effective in stopping the spread of hate speech, perpetrators can create new accounts or repost things. If everyone can act responsibly online, there will be peace on Facebook,” said Nay Phone Latt.